To get an idea of how far McLaren has come with the new 720S, just get its engineers onto the subject of what’s left – how they’ll possibly outdo this car when the time comes. That, they’ll say with a sigh, is the question. When they introduced the 675LT, even the 650S, they already knew this was coming. They knew what the 720S – P14, in McLaren’s development speak – would be able to do and they knew how much further ahead of both the 650 and 675 it was, in all areas. They put so much into the 720S that now they’ve got nothing left in the tank. This car, make no mistake, feels a generation and a half on from a 650S. It’s so fast, so usable and so controllable that it might – just might – be the best supercar on the planet. I’m getting ahead of things. So, 720S. McLaren’s naming structure is now familiar, and it won’t be the only familiar thing about this car if you follow sports cars. Because it’s both a supercar and a McLaren, it comes with certain engineering characteristics. It’s mid-engined and rear-wheel drive and has a twinturbocharged V8 engine. It has a carbonfibre tub, albeit a new one, whose integrity now stretches over the occupants’ heads, increasing rigidity and, because it removes steel from the top of the structure – the windscreen surround, for example – it’s now 18kg lighter than before and lowers the centre of gravity. In front of that is double wishbone suspension; ditto at the rear. That’s linked front to back and side to side by McLaren’s hydraulically connected damper system, Proactive Chassis Control II, which is improved with the addition of new sensors but still baffles the heck out of mutton-headed old mugwumps like your correspondent. In short, it gives stiffness in roll conditions and compliance on rough roads, and it negates the need for anti-roll bars. If McLaren’s Super Series cars to date have had anything in common – MP4-12C, 12C, 650S and 675LT – it’s that their ride quality has been uncommonly good. Because of the rate of progress in tyre development, though, the standard tyres here are said to be grippier than the Corsas last time around, plus they last longer and should ride better. There’s newness in the 720S – so much newness everywhere that 91% of the car is new, with the only bits you can see carried over pretty much being the reversing light. But there’s familiarity to the engine, where 41% of it is new, in becoming a 4.0-litre V8 instead of its predecessors’ 3.8 litres. It ain’t just stroked, says McLaren (although stroke is up by 3.6mm, while bore is unchanged); there are new conrods, pistons, crankshaft, twin-scroll turbochargers and more, with the intent of providing more response as well as more power. The skin is mostly carbonfibre, partly aluminium and, well, interesting to look at, due mostly to the sharky, waspy front light treatment that… well. Apparently, it splits opinion even within McLaren. And, look, I’m no arbiter of aesthetics myself but they’re growing on me (“Less bad than when I first saw them,” according to our videographer). They do make the 720S pretty sensitive to colour, I think, making it one of a few cars that suits dark tones. They are functional, at least, ducting and channelling air around the front of the car, and there are no longer visible ducts on the doors. Instead, there’s a channel in the top of the twin-skin door, which reduces cabin width slightly. The Super Series McLarens retain active aerodynamics and the rear wing, which still becomes an air brake, is now full width across the back of the car, so it’s 30% more effective than before, while overall aerodynamic efficiency – the trade-off between drag and downforce (McLaren hasn’t yet given a drag coefficient) – is more than doubled. That cabin, then. Cramped, as a result of the aero changes outside? Not a bit of it. You do sit closer to your passenger, but the lower sills and the doors, which now hinge to all but vertical and take up a foot less width in the process, make getting in and out a fair bit easier – and with less head-bashing. But the changes to the tub mean that the A-pillars are particularly thin (and left unadorned by trim), while thin carbonfibre beams criss-cross the original Honda-NSX-ish, Pagani-Zonda-ish looking occupant compartment, with glass panels everywhere making it a doddle to see out of. Not since the first NSX or, say, Ferrari 355 has a full-blown mid-engined supercar been so easy to see out of. That airiness takes away any sensation that you might feel remotely cramped in here, and the rest of the cabin is a lot more accommodating. The driving position remains bang on as usual – dead straight, with one of the most adjustable steering wheels in motordom (connected to a rack that is still hydraulically assisted, incidentally). Either foot will do for the centrally mounted brake pedal, and there’s a new pop-out instrument binnacle – a bit unnecessary – and a revised central stack, on which lives a new touchscreen controller (it’s far easier to use than the old Iris system), plus McLaren’s driving controls as usual, which remain slightly more complicated than they strictly need to be. Still, it’s a nice place to be, with better materials. The stitching on the Alcantara on this pre-production car could be better in a couple of places, but on full-production McLarens, it usually is. 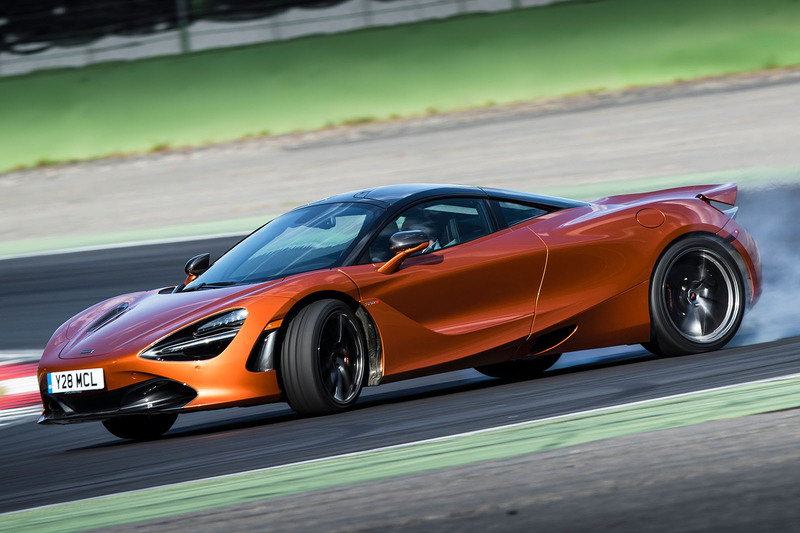 The point is, though, that the 720S is meant to be more broadly capable than the 650S. Better on the road and better on a track, although not quite as extreme as a 675LT when it comes to the latter. 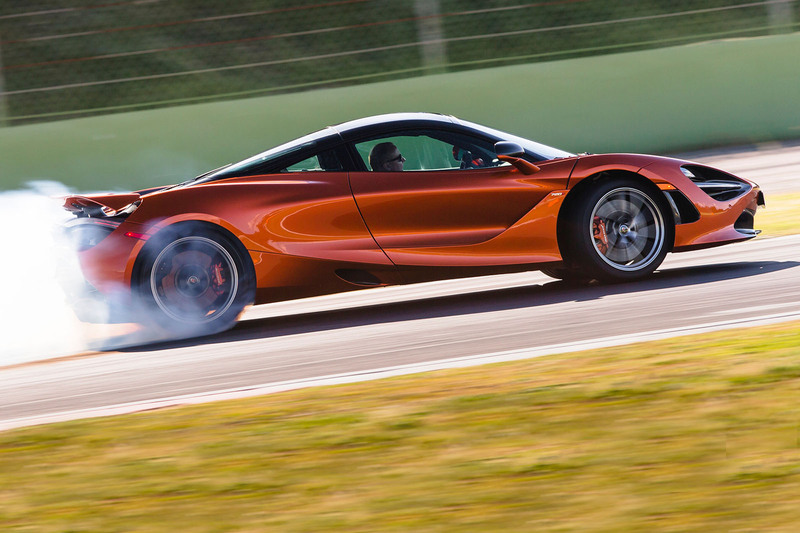 The 720S certainly rides well enough. It takes a certain confidence to hand a 710bhp supercar to a bunch of journalists who’ve never sat in it before and send them straight out into Monday morning Rome traffic, but there you go. Visibility is terrific. The ride is compliant. The dampers still have three settings – Comfort, Sport and Track (with Comfort replacing Normal, because “there’s nothing normal about a McLaren”, don’cha know) – and you’ll leave them in Comfort most of the time. The motor and gearbox have the same three settings, too, selected independently from the chassis ones. In town, the McLaren’s engine doesn’t shout loudly at you – even though our test car was one of the more racy specs, with a sports exhaust and also standard-sized fixed-back bucket seats (you can get wider ones, too). Anyway, the engine. Not loud – not around town, at any rate. It’s powerful-sounding, sure, but there isn’t anything like the obvious grumble of an AMG V8 or the hollow ‘bwoap’ of something from Ferrari. 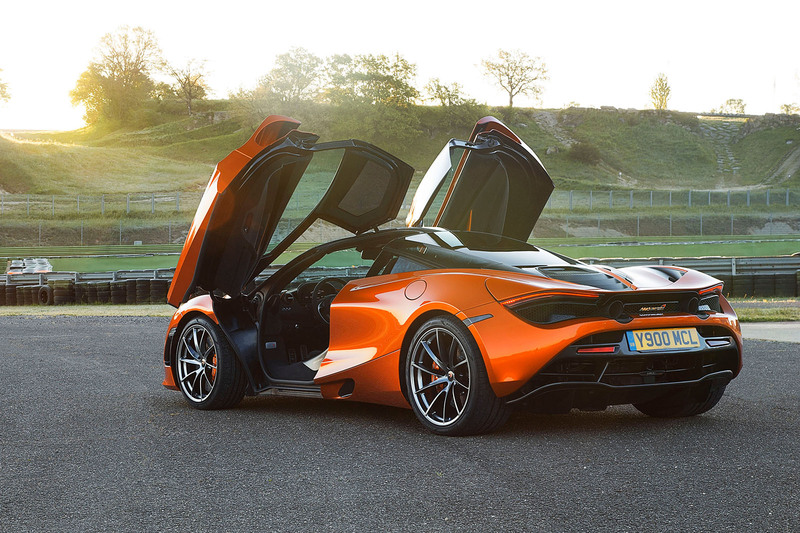 But it does seem to shrink around you pretty quickly, the 720S. Daft, really, how we sometimes sit and wonder, “How much power is too much?” Then you get in a £218k supercar and thread it through traffic and out beyond the suburbs onto crummy roads between fields, up and down gentle hills, and realise that it’s as easy to drive as a mid-level family saloon. Only it’s quite a lot faster when you want it to be, obviously. There’s so much torque, with little noticeable lag, that it becomes second nature and an utter doddle to drive the 720S around in relatively high gears on the road, surfing the mid-range when you need an overtake, or three at once, enjoying the suppleness of the ride, which combines sweetly with the pure, oily slickness of the steering, which, at 2.5 turns between locks, is wonderfully geared and weighted, takes on reassuring midcorner weight and offers relatively uncorrupted road feel, like little else in this class. Certainly, more than a Ferrari 488 GTB, and with less nervousness. It’s so easy to develop a flow, a rhythm. Yes, it has 710bhp, but as a McLaren bloke replied when we said how easy it was to drive a P1 on a circuit despite it having more than 900bhp: “Of course it is. You don’t have to use all the throttle.” Unless you want to, that is. We did, which is why McLaren had hired the Vallelunga circuit. How much is too much? When does a car become uncontrollably powerful? Not yet. This is the utterly absurd, wonderfully ridiculous thing about cars like the 720S and, yes, the 488 GTB. They take levels of power that a decade and a half ago seemed utterly crackers and install them into chassis so capable that you can be on full throttle, at the top end of fourth gear, in your second lap out of the pits, wondering what this fuss about too much power is all about. 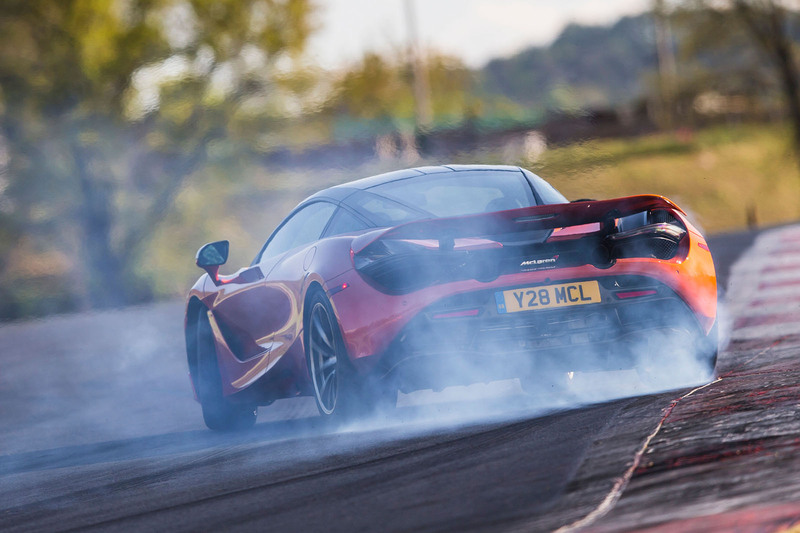 The 720S is brilliantly approachable – yes, bonkers, ludicrously fast, but with a ride that, even on a far from smooth circuit and pulled into its Track mode, copes with bumps with superb absorbency while retaining mammoth control of its body. There’s precious little dive under braking, little lean when turning and a thoroughly supported back end under acceleration. The steering’s weight remains consistent and pure, there’s genuine feel, gearshifts are crisp and the engine response is strong right through the range – no flat spots, no whoosh of turbo power that eases out as the revs rise towards 8000rpm, just broad, flowing, ever-increasing urge. Does it sound special enough? Perhaps not, still. It’s a powerful sound, an appealing sound and, on occasion, a loud sound. But it’s not the reason to drive this car. Throttle adjustability wouldn’t have been with a 650S, either. But now? Now, it is different. No, there is still no limited-slip differential, electronically controlled or otherwise, but there is so much power and brake steer does such a decent job of providing chassis adjustability that the 720S is responsive on the throttle. There’s a hint of steadystate understeer, as you’d hope, but trail the brakes towards a corner, or lift mid-corner, and there’s genuine adjustability to the 720S’s moves. It’ll tuck in, rotate around a position that feels right next to your seat, willingly involve and engage you in choosing its angle and then slide – up to a small point if you leave the stability on, a bit further if you switch it half off and to varying degrees of side slip if you choose the Variable Drift Control, from ‘not really sideways at all’ to ‘quite sideways really’. 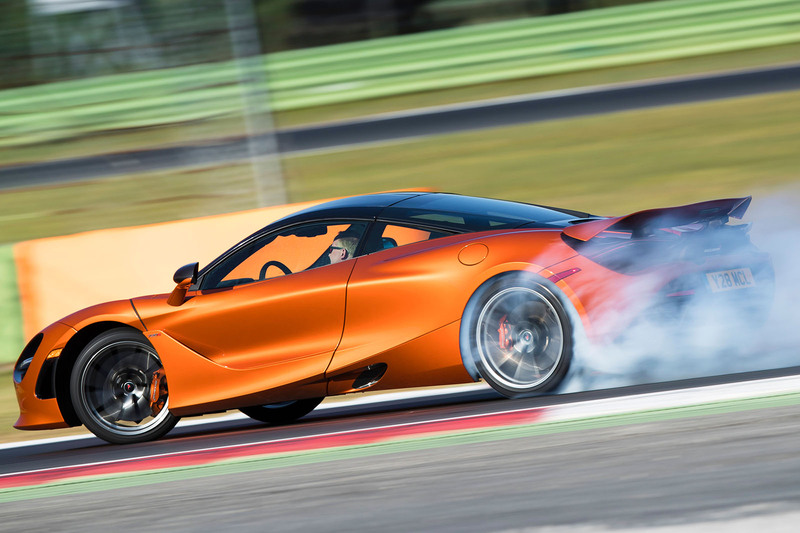 But never as sideways as when everything is off, in which case the 720S will smoke itself up merrily. I’m not convinced it’s quite as docile as a 488 GTB on the limit, but it’s now in the ballpark in terms of wanting to engage you. I’m darned sure it’s faster, too, because, while McLaren won’t openly admit it, it’s probably faster than a 675LT and therefore, I suspect, even faster than a P1. And while it’s less furious in attitude than a 675LT or, say, a Porsche 911 GT3, it’s so much more approachable and broadly capable at the other end that it is almost beyond comprehension that the very same car can be this docile, this comfortable and yet this fast. It shouldn’t happen. But it has. In only McLaren’s seventh year as a car manufacturer, it has built a new-generation model that answers nearly every criticism thrown at the car it succeeds. The 720S is a world class supercar, no question. It may even be the world’s best supercar – we'll find out soon enough. I like the way it looks, and i like it in orange. It may not be a pretty car, but at least it looks like something, unlike the 650 and MP4 that where incredibly boring. Wow. Seems like quite the car. Two questions though - is the road noise on the video a pre-production issue? And if the roof spur is now an integral part of the structure, how will they engineer the spider version? Mind you, with all that gorgeous glazing, would you even want the spider anymore? Ferrari, Lamborghini, Porsche aren’t going to like it. All good but I just wish it was as good looking as the original F1 which no subsequent McLarens can remotely match. ...I'm with the videographer - "less bad than when I first saw them". They have grown on me a little, and actually kind of work from some angles, but not sure I'll ever be totally comfortable with them. At least they're different, and I like the overall look. Reads as though, unsurprisingly, this car is a terrific achievement. If there were doubts before, the 720S must surely show everyone that McLaren is the world's definitive sports car maker, and by a large margin too. Everything they've produced since the 650S has been nothing short of brilliant. Somehow their cars combine scintillating performance and great handling with a fabulous ride, comfort and genuine usability, basically they make sports cars without the compromise. And to top it off, the way they go about designing, engineering and constructing their cars redefines standards too, and not just at the hypercar level. The attention to detail of McLarens is sublime. As for the 720S itself, it's surely a class leader by miles while what they've somehow produced is a supercar that can outdrive and outrun some hypercars such as a Huarya Aventador which is a remarkable achievement. And it's also brought striking, exotic hypercar type looks to the class too although I think a Huracan and 488 look much better. What McLaren has achieved in 7 years is simply staggering and there is no doubt Porsche will be puzzled that after decades of making sport cars, they've been left looking like amateurs producing inferior cars by a firm who has only been making cars on a serious basis for only 7 years. A rethink will be needed in Stuttgart. Huarya Aventador? Hmmmm. As for the Porsche-dissing - and as I'm on my 14th I suppose I should declare an interest - it's not really fair to compare the products of a company whose range is c. £50k-120k for their mainstream products versus a car that starts well over £200k and nicely specced will probably average out around a quarter of a million. I think what McLaren has done IS amazing and I'd love to buy one of their cars but to say Porsche have "been left looking like amateurs producing inferior cars by a firm who has only been making cars on a serious basis for only 7 years. A rethink will be needed in Stuttgart" is absurd. It's all very impressive, but to what end? Drive an NSX, F355 or similar (I cite them simply because they're referred to in the article) and we'll still be going as fast as our limited driving skills allow, with more tactility to boot, in an appreciating beauty. Which is a shame. I suppose with all the engineering talent at hand they could make it sound how they liked, but I guess all the 'best' exhaust soundtracks have already been claimed by Ferrari, Porsche, AMG, Lamborghini and Aston Martin. A tool for the Job......?! Sorry,but it is STILL Souless,it does not make me go WOW,,,!!! that is awesome!! !,it has been designed to do a job,and it probably does very well,but that's not all a Car is about,no,beating the you know what of the opposition ISN'T all it should be about.